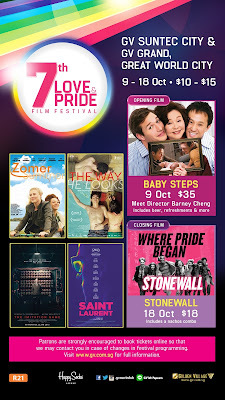 Singapore, 18 September 2015 – Singapore’s leading cinema exhibitor continues to champion universal love at its Love & Pride film festival for the seventh year. In the month of October from 9 th October 2015 to 18th October 2015, Golden Village Multiplex has curated a list of films that features the best in contemporary cinema. Hosted exclusively at GV Grand, Great World City and GV Suntec City, the 7th Love & Pride Film Festival opens with the much anticipated movie, Baby Steps. From the producers of Crouching Tiger, Hidden Dragon comes a heart-warming tale of the complexities of modern love and age old tradition. Directed and starring Barney Cheng, the Mandarin drama puts you in the shoes of Danny, a Taiwanese-American man and his boyfriend Tate who both long to have a baby. Their relationship and unconventional journey into the parenthood becomes more complicated when Danny’s wellintentioned but meddlesome mother tries to control every aspect of the process. At the opening night of Golden Village’s 7th Love & Pride Film Festival, Director Barney Cheng will be making an appearance at the Gala Premiere where he will share a personal account on what inspired him to write, direct and play the role of the leading actor, Danny in Baby Steps. 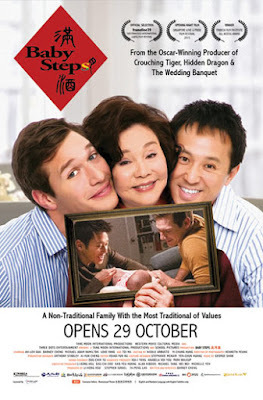 “Golden Village is proud to be back with the 7th instalment of the Love & Pride Film Festival. This film festival has always been well received since its inception. This film festival is also a celebration of independent, contemporary films that we hope to continue to screen for non-mainstream movie lovers” said Clara Cheo, Chief Executive Officer, Golden Village Multiplex Pte. Ltd.
Golden Village 7th Love & Pride Film Festival opens with the Gala Premiere of Baby Steps. Be the first to catch Baby Steps and meet Actor and Director, Barney Cheng where he shares his inspiration behind Baby Steps.